In recent months there has been a lot of press coverage about Japanese knotweed ‘ASBOs’. This followed recently reformed powers under the Anti-social Behaviour, Crime and Policing Act 2014. The new powers allow action to be taken against a property owner if it can be proven that their Japanese knotweed is having a detrimental effect, of a persistent or continuing nature, on the quality of life of those nearby. the Environmental Protection Act (EPA) 1990, which classes knotweed as a ‘Controlled Waste’ which must be appropriately handled and safely disposed of at a licensed waste facility. However, by far the most active area of legal action is 3rd party litigation, where you can be sued if your knotweed causes a private nuisance on someone else. Litigation action can also be taken against a surveyor, if they ‘unreasonably’ fail to spot knotweed on a property, or against a property seller if they knowingly fail to inform a potential purchaser of the presence of knotweed on their property (e.g. by falsifying information on their TA6 form). The new ‘ASBO’ powers allow the police or local authorities to serve a Community Protection Notice on an individual or body to require them to control or prevent the growth of the Japanese knotweed that’s causing a detrimental effect. If there’s no action to remedy the problem then a fine or prosecution can follow. On summary conviction for breach of a notice, fines of up to £2,500 for an individual and £20,000 for a company or body can be levied. In addition to the new ‘ASBO’ powers, in early 2014 the Law Commission issued guidance for the introduction of Species Control Agreements (SPAs) and Species Control Orders (SPOs) to encourage, or force, landowners to take action to stop invasive non-native species on their land from affecting their neighbours. Such legislation is already in place in Scotland and would be applied in England and Wales by an amendment to the Wildlife & Countryside Act, which is currently being put in place via the recently enacted Infrastructure Act 2015. At a European Union level, a new Regulation came into force on 1st January 2015. The Invasive Alien Species Regulation will establish rules to prevent, minimise and mitigate the adverse effects of invasive alien species on biodiversity and ecosystems as well as on human health, safety and socio-economic impacts. The first stage of this Regulation is for Member States to draw up lists of species of Union Concern, which will then be the target of future management plans. Due to its highly invasive nature and widespread distribution throughout Europe, it is highly likely that Japanese knotweed will be on many countries’ lists. It should be noted, however, that it is not currently an offence to have Japanese knotweed on your land and that there is no legal obligation to remove it or to notify anybody of its presence. 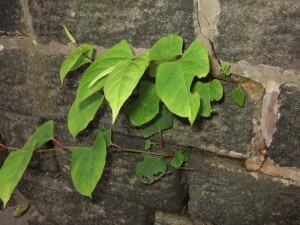 In the current and proposed legislation, an offence is only likely to be committed if you allow the knotweed to spread onto neighbouring land to the detriment of others. Find out more about Japanese knotweed legislation here, or give us a call for professional advice from one of our experts. Our staff are regularly appointed as expert witnesses in legal cases where Japanese knotweed affects property and/or causes a nuisance or damage.